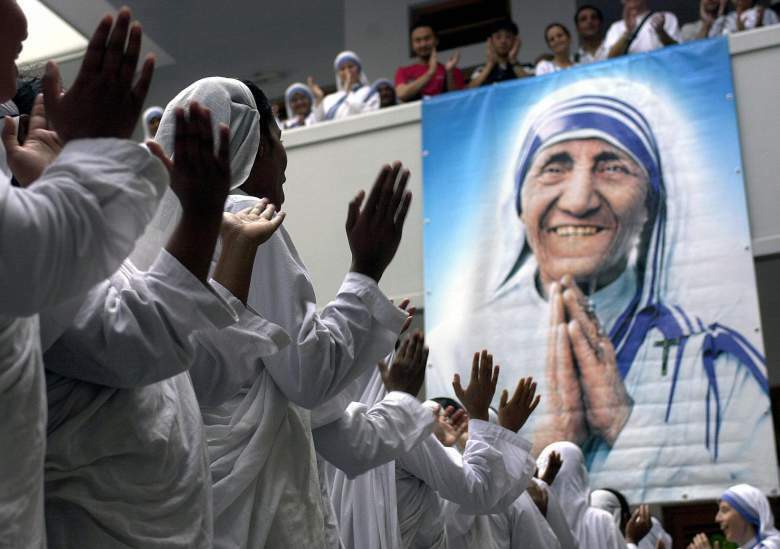 Acclaimed dead old woman ‘Mother Teresa’ has been canonised as a saint by Pope Francis in a ceremony at the Vatican, after the attribution of Leicester City’s title victory to her magical powers of posthumous miracle-making paved the way for her incorporeal ascension. Born Anjeze Gonxhe Bojaxhiu in the Macedonian capital of Skopje, she was renowned for her work with the poor in Calcutta and other areas stricken by poverty, but didn’t previously qualify for sainthood due to the Vatican requiring two miracles and her possessing only one accumulative certificate for various smaller ‘miraculous acts’, such as flipping heads seven times in a row. But the canonisation was finally able to go ahead some nineteen years after her death after Francis’ clerical team were able to credit the Foxes’ impossible Premier League championship to her, despite protestations from the club, and hundreds of thousands flocked to St Peter’s Square to see her remains fired out of ancient basilic God’s Will into the Sea of Galilee. Prior to the ceremonial firing of the canonical cannon, Cardinal Angelo Amato read an excerpt from an authorised biography of Bojaxhiu, entitled Big Momma: The Terri SickHands Story, then demanded that Pope Francis “make the angel face into flying wing beauty”, and the latter agreed. It is reported that over a hundred million people worldwide watched the ceremony, including on large TV screens in predominantly Catholic cities and towns, in order to watch Ms Bojaxhiu be celebrated for her charity and compassion by a man who lives in a golden palace and believes that contraception is worse than AIDS. Francis completed the work begun by John Paul II, who promised to “rush through the paperwork”. Francis addressed his congregation by saying that Ms Bojaxhiu had “bowed down before those who were spent, left to die on the side of the road, seeing in them their God-given dignity and the beauty that only comes from suffering, the suffering that was meant for them”. After a long and uncertain pause, in which the Holy See seemed uncharacteristically ruffled and looked even more like Jonathan Pryce than usual, Francis announced that 1500 homeless Romans would be rounded up and taken by bus to the ceremony, to be fed pizza in a contemporary evocation of the fish and loaves fable. Bojaxhiu founded the Missionaries of Charity in 1950, having named herself after patron saint of missionaries Therese de Lisieux while working in the convent of Loretto, and her order ran nineteen homes worldwide and bagged her a Nobel Peace Prize in 1979, an award also won by Barack Obama, Henry Kissinger and Holocaust enabler Cordell Hull. To mark the ceremony, The Daily Belter’s resident Weegie-with-a-Ouija Dale Carnoustie attempted to contact her for an exclusive interview, but only succeeded in receiving whimpering vowels and an old sound bite of Bojaxhiu talking about how being surrounded by “beautiful suffering” made her feel “closer to Jesus”.